“This is potato soup, but there is something else in it, other than potato, with a subtle flavour” – G, my husband’s reaction when I served this soup for the first time. That is exactly how I will describe this soup too. The delicate flavour of leek turns this otherwise plain soup, into a delectable one. With its velvety texture and creamy taste, this soup is worth trying. Boil the potatoes until soft and keep aside. Heat oil in a soup pot. Sauté leeks in medium flame until softened. Reduce the flame and add the flour. The flour will change colour and release a nutty aroma once it is cooked. Now add the milk and bring it to a boil. Add the cooked potatoes and allow the flavours to blend together. Season with salt and pepper. With a hand blender, blend the soup leaving small chunks of potato. Adjust the thickness of the soup by adding more milk. Recheck the seasoning and serve with tortilla chips for crunch. Psst!! If you want a more divine soup, omit flour + milk and substitute with cream. And, that is ‘Creamy Leek – Potato Soup’. Did somebody say something about calories?? 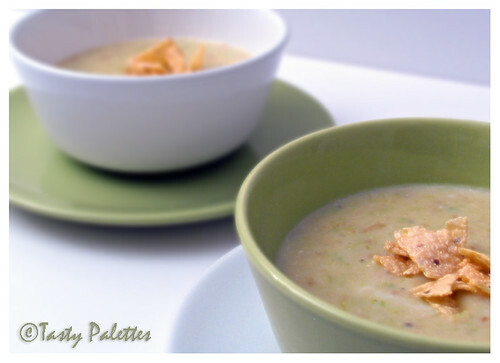 I do like leek and potato soup, but your idea of serving it with crunchy tortilla chips is awesome! You can even pan fry some tortilla strips and add to the soup Nupur. Sia, Thanks for dropping by. You really are enjoying those leeks! I've bookmarked this to make on a cold rainy day. Looks really yummy! Classic recipe and write ups..he he I am slowly turning to be your ardent fan..
BTW...what was ur good question to me, dear? Hearty thick soups on a cold day..wow..Do try Manisha. Priya, you will be surprised how mellow leeks are..I would be happy if yr visit to my blog will also become a routine :) Thanks for the compliments..
Hey Bharathy... Din't I ask for yr Email ID? Comments pakkave illaya? slurp slurp, soup looks YUM! that pic looks amazing. tortilla for garnish is a very nice combi. Nice soup suganya! I have never made potato soup! Should try this.